It's noon in Kenya's Masai Mara and here, on the dirt path leading to Endesekra village, chief Kereto Nangiyoo is telling me how he lost his left arm. "A lion took it in the 1980s while I was protecting my village," says the chief, using his right arm to point to the circle of mud-brick huts in front of us. "When a man cannot protect his property, he is not a man," he adds, with a look that tells me he would still do whatever it takes to keep his home safe. As chief Nangiyoo leads us into his village, which we're visiting as part of an itinerary crafted by Bench Africa to celebrate its 50th year guiding travellers, we're greeted by a dozen striking Maasai warriors. They wear traditional red and black shuka cloths, their necks, arms and ears dripping in colourful beaded jewellery that gleams in the intense, equatorial sunlight, their hair carefully braided and oiled. They begin singing, creating a guttural throbbing, an a cappella soundscape punctuated by grunts and shrieks. The chief tells us it is a prayer welcoming us to the small community. Soon, the young warriors start jumping, stepping forward one by one to leap into the air, higher and higher and in time with the rhythmic song. This is the traditional adamu jumping dance, a primal display of the men's bravery and strength. It's completely entrancing. When it's over we're left standing in silence, not quite knowing whether to applaud or bow in reverence. The Maasai, one of Africa's most famous tribes dating back some 40,000 years, make up only about 4 per cent of Kenya's population. Having this chance to meet them and witness their rituals is a cultural experience that sets Kenya apart from other African safari destinations such as Botswana and Zambia, which can often be devoid of any sign of human habitation. With the singing finished, we're shown into one of the small, low huts. There are no windows or chimneys and the air smells heavily of wood smoke, dusty earth and cow dung. As we sit on the rammed earth floor and let our eyes adjust after the exterior brightness, we learn about the Maasai from John, one of the adamu dancers. The Maasai can marry up to eight wives, we're told, and are pastoralists who live mostly on the meat, blood and milk of cows. Cattle are part of the Maasai identity, as well as being a sign of wealth and status. "Maasai value their cattle more than their wives," our Cessna pilot had mentioned to us on the flight into the Mara. The Maasai believe that when their god Ngai gave them their land, he also gave them all the cattle on the planet and if anyone else on Earth owns a cow, they believe it was stolen from their ancestors. Inside this rustic home, hearing these stories while a chicken pecks at our feet, it feels as if time has stood still for centuries. But as we walk back to our safari truck, we're reminded that times have indeed changed for the Maasai. Two of the men reach into their cloaks to grab mobile phones, wanting to take our details so we can share photographs and stay in touch. The image of the brave, ferocious warrior drops away and suddenly they are simply sweet young boys wanting to connect, just like the rest of us. The modern Maasai must work, too. 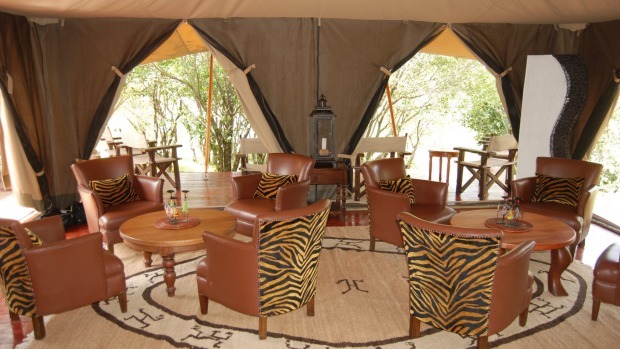 Back at Mara Ngenche camp, set discreetly on a forested section of unfenced land at the confluence of the Mara and Talek rivers, Maasai work as askaris, or guides. Each of the 10 elegant tented rooms, complete with bathtubs, four-poster beds and plunge pools, is guarded by an askari. Next morning when I unzip my tent, an askari suddenly materialises, wrapped against the pre-dawn chill in his red cloak. He has been beside my door all night, protecting me from the hippos I've heard honking by the river banks and the leopards that are said to occasionally roam through camp. During four days in the Mara, our guide and driver is a kind and clever Maasai man named Milton Kariankei. As he drives us across the naked, cinematic sweep of savannah, he exhibits a tribesman's knowledge of the bush, seeming to always get us in exactly the right place, at just the right time. In a patch of savannah to the right, where the sun rakes through the grass, he points to where nine lions stretch, groom and sniff the air in preparation for the evening hunt; to a stretch of road where a hyena happens to lay, uncharacteristically supine, gazing lazily at our truck with big, wet eyes; and to a dirt track just as a herd of elephant stroll along, toddlers peeping between their mother's legs, the huge bull bathing itself in clouds of dust. As we drive, Kariankei expresses often how proud he is to be Maasai and how deeply connected he is to this reserve. "I couldn't live in a city, unless it was by force," he says one afternoon, as we sit in the vehicle watching giraffe awkwardly part their front legs to drink from a watering hole. "It's too busy, too much traffic, too much congestion. People are not happy and they don't trust each other." Spending time in the Mara does seem to make our warp-speed lives back home seem kind of awful. Particularly at sunrise, as the day sheds its darkness. Looking out over the empty savannah grasslands, worries tend to evaporate with the morning mists, and the entire body seems to exhale as nature's gentle rhythms take hold. There's a sense of homecoming – no surprise, for this is where humanity was born. On our final evening, Kariankei surprises us by pulling up somewhere I can describe only as the middle of nowhere, where a full bar and two more cloaked Maasai tribesmen await. We order drinks and pull up canvas chairs by a brazier fire, but moments later purple clouds cloak the sky and thunder growls in the distance. For a moment, anxiety grabs me. We're in the middle of the African bush, a storm approaching, with nothing but a glass of Amarula liqueur and a camera to defend ourselves against hungry lions and hyenas should we get stuck. But then I look over my shoulder. I see the three Maasai chatting together, the day's last light illuminating their faces, their bodies etched against the purple sky. And just like that, the fear evaporates. You'll have to get up before dawn, but it'll be worth it. Soaring peacefully above the savannah, you'll get a bird's eye view of the animals and landscape below. Back on solid ground, a champagne bush breakfast awaits. A 4WD gets you closest to the action. But a game walk, taken with an armed guide, reveals a more detailed side of the Mara. You'll identify footprints, discover nests and burrows and be immersed in the silence of the open plains. From July to October each year, 1.5 million wildebeest gallop through East Africa, accompanied by zebra and followed by predators including lions, cheetah and vultures. 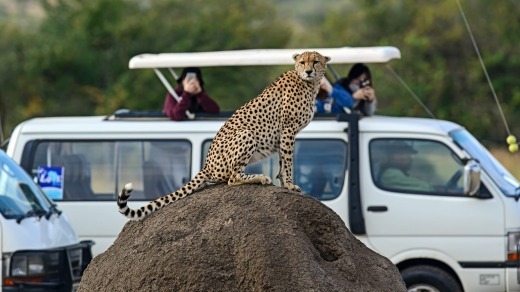 The Mara is one of the best places to experience this phenomenon. Whether you're a novice or a pro, there really is no better place to work on your photography skills than the African bush, with all that movement, light, drama and detail to capture. Invest in a decent camera or lens before you leave. Alfresco meals are a classic safari experience, from casual breakfasts eaten standing next to the safari truck to downright posh – think full buffets with hardwood dining tables and champagne set up in the middle of the bush.